Any yarn and hook you desire. I used a 4mm metal hook and stylecraft DK acrylic yarn to achieve a hat measuring 5.5 cm or 2.5 inches in height and 4cm or 1.5 inches wide. If you wish to make the hat larger add more increasing rounds at the top BEFORE crocheting in the back loops. This will give the hat a wider circumference. It is recommended that a stitch marker is used to mark the beginning of each new round. 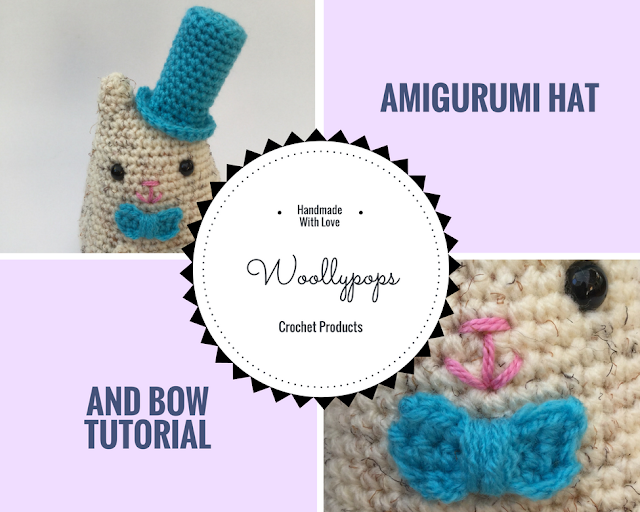 Hat is made in the traditional amigurumi method, do not join after each round. Any problems please do leave me a comment, or contact me on social media. Okay let's hook and roll! 1 dc in each stitch (24) fasten off. Et voila your hat is complete. I stuffed mine to attach it to my kitty, but it's really up to you how you style it out. Tie a long piece of yarn around the middle of the length of crochet to make a bow shape and sew in place. My daughter says he looks like a circus cat 🤔 not the look I was going for but I'll take it 🤣 she thought he was very cute. Hi hi beautiful people, and welcome to my first ever pattern! im so thrilled to be sharing this pattern with you. 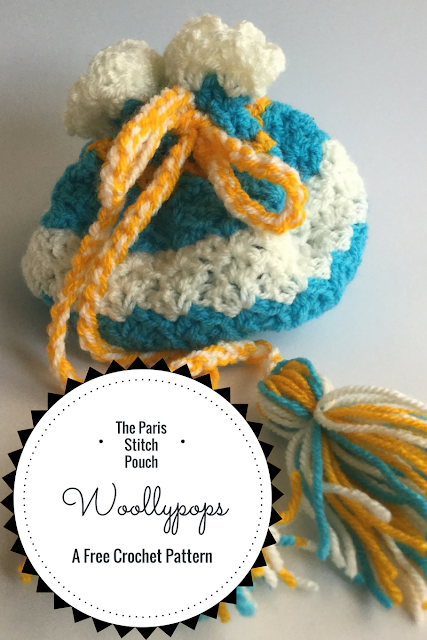 A few weeks back I shared a tutorial for the Paris stitch here on the blog. After writing it up I got thinking, what cute fun accessory can I turn this stitch into. I played around a tad, and eventually came up with this. Fun, funky and bright, a cute accessory pefect for summer. so without further ado scroll down and the pattern will be waiting. You can use any yarn and hook for this project depending on the look / feel you want your pouch to have, or the size you want it to be. I used a 4mm hook and Stylecraft acrylic DK yarn in sunshine, turquoise, and cream. For a pouch with a finished size of 15cm high unfilled and with a base of 15cm in diameter. The base of the pouch is worked in continuous rounds. I used a stitch marker to mark the beginning of each round ( similar to amigurumi method). The Paris stitch will be worked into the last round of the base. The Paris stitch is made from a set of stitches divisible by 3+1 extra stitch. To make the bag bigger or smaller just add or eliminate rounds based on this stitch count. Ensure you have the correct number of stitches after every round. 11. Begin the Paris stitch. Ch3 (1trb+1ch) in the first stitch work the following (1trb, 2ch, 1dc) *skip 2 stitches work (2 trb, 2ch, 1 dc) in the next stitch. Repeat from * around joining with a slip stitch to top of the beginning chain. 12. Ch 3 and turn. Work 1trb, ch 2, 1dc in the first ch2 space from the previous round. *in the next ch2 space work 2trb, 2 ch, 1 dc. Repeat from * around. Join to top of the beginning chain with a slip stitch. 13. Repeat round 12. Change colour if desired at the end of the round. 14. (Decrease round) Paris stitch decrease. Begin the row, ch3, decrease in next 2 chain spaces (yarn over, insert hook into first ch2 sp, yo, pull through 2 loops (2 loops on hook) yo insert into next ch2 sp, yo, pull through 2 loops (3 loops on hook) yo pull through 2 loops (2loops on hook) yo pull through last 2 hoops) decrease finished, trb,ch2,dc into same ch2 space as decrease ended in . Continue round to end. Slip st in first decrease st.
16. Repeat round 14 (decrease round) change colour if desired at the end of the round. 19. Repeat round 12. Change colour if desired at the end of the round. 22. ch3, skip a stitch, 1 hdc in next * skip a stitch, 1 hdc in next* rep around. Note, count all stitches in this round (trb and dc from previous round) as 1 stitch each. Count ch2 spaces from the previous round as 1 stitch. Join into 1st hdc space made. 23. ch3, hdc in each space made in the previous round. Slip st into first space made in the previous round. Change colour if desired. 24. Paris Stitch in every other space around. Join with a slip stitch. 25. Ch 3 Paris Stitch around. Join to the top of the chain with a slip stitch. Fasten often. With two colours of yarn together chain a length of your choosing. Thread the chain through the hdc spaces made in round 23. Please do tell me how you like it, any feedback would be gratefully received.